Krabi located at southern of Thailand, offering a combination of inexpensive accommodation and great rock climbing routes that make it popular with both backpackers and climbers alike. Looking at the waves crashing over the rocks we had to cross to make it home. 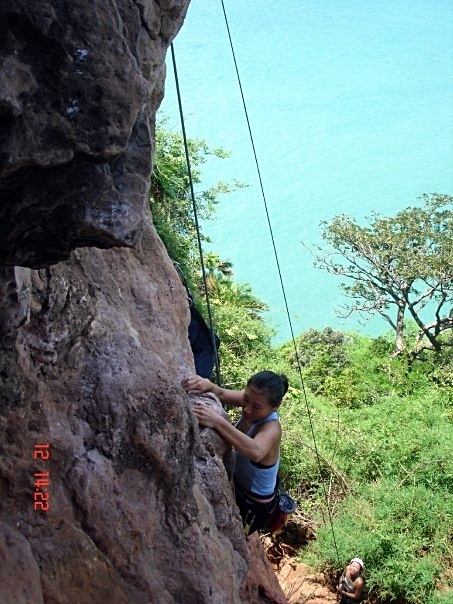 The rock climbing at Krabi, from single- to multi-pitch routes, is mostly right off the beach. The problem was that we had twenty kilos of climbing gear that salt water would do no good to and swarms of mosquitoes, sensing our tasty white flesh, were silently drifting from their jungle home to our rapidly eroding beach. Rock climbing at Krabi becomes a MUST-Climb destination in South-East ASIA, the best climbing destination in Thailand. 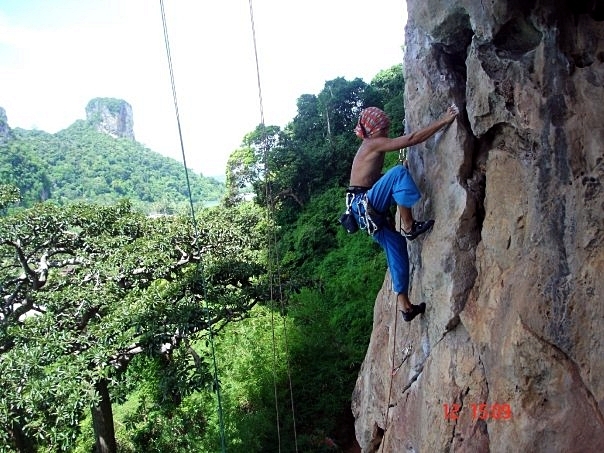 Its attracted climbing enthusiast from around the world every year to spend a wonder of times for everything on the rock, the limestone cliffs in the area offer varied levels of difficulty and spectacular views across the ocean and back inland. 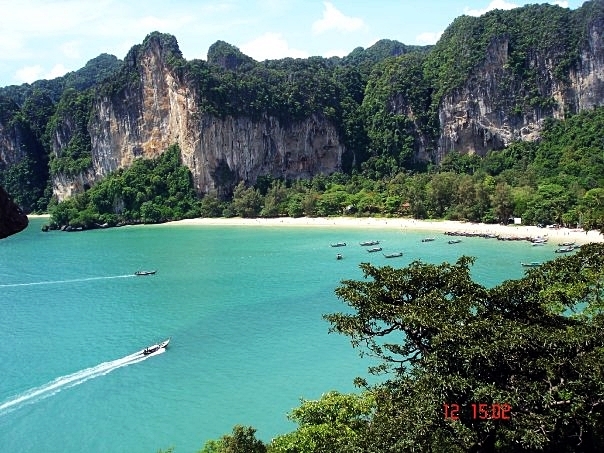 Tonsai is a climber alike beach in Krabi, it’s offer budgeted accommodations for climbers that don’t spend time staying in the room, and it’s center of climbing paradise. Walking along the beach and see people climbing everywhere on the wall. Thailand Rock Climbing guide book is available for purchase at some pro-shops in Tonsai or Railay beach. There are very few great restaurants/cafe in Tonsai beach and don't miss the breakfast, the breakfast are great. Beside of that there is also cool bar with really good toast and iced coffee. Being from a country where lead rock climbers that want to live till the next season are had the potential to be a climbing paradise. 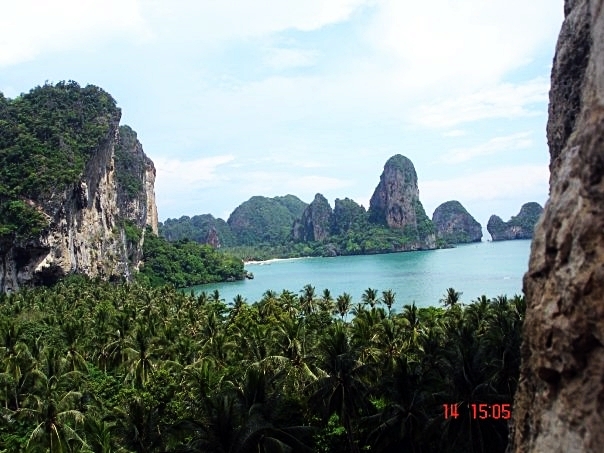 It was reputed to have everything a sun-sick climber could want: crystal blue skies and seas and spectacular limestone cliffs, made safe by metal bolts, rising directly off the beach. I was looking forward to climbing without the usual hassles, no trudging across bracken and sludge trying to find the next climb, no staring alternately at map and rock face, trying to determine if the vague crack really is the route we're looking for, no worrying whether the last piece of protection would hold a fall.